Ariana Reines will open the evening with a reading of “Littoral Madness”, a section from Chris Kraus’ forthcoming critical biography of Kathy Acker, and will complete the evening with readings of her poetry. In between two talks will be delivered by Melissa Gordon and Meredyth Sparks on the value of presence in art in relation to gender, history and genius. Meredyth Sparks was born in Panama City, Florida, in 1972. She earned her B.F.A. from the University of Tennessee, Knoxville, and her M.F.A. from Hunter College. Sparks' solo exhibitions include The Ism That Dares Speak Its Name, Parmer at Abrons, New York (2015); Windows and Screens, The Arts Club of Chicago, USA (2013); Accordion, galerie frank elbaz, Paris, France (2013); and So I will let it alone and talk about the house, Locust Projects, Miami, USA (2012). Group exhibitions include Body / Image, Susan Inglett Gallery, New York (2015); A Private View präsentiert: Die ROCCA Stiftung., curated by Heike Fuhlbrugge, Autocenter, Berlin (2014); and Test Pattern, Whitney Museum of American Art, New York (2013. Sparks currently lives and works in New York, NY. Born in Salem, Massachusetts, poet, playwright, and translator Ariana Reines earned a BA from Barnard College, and completed graduate work at both Columbia University and the European Graduate School, where she studied literature, performance, and philosophy. She is the author of The Cow (2006), which won the Alberta Prize from Fence Books; Coeur de Lion (2007); and Mercury (2011). Reines’s first play Telephone (2009) was performed at the Cherry Lane Theater and received two Obie Awards. Her translations include a version of Baudelaire’s My Heart Laid Bare (2009); Jean-Luc Hennig’s The Little Black Book of Grisélidis Réal: Days and Nights of an Anarchist Whore (2009); and Tiqqun’s Preliminary Materials Toward a Theory of the Young-Girl (2012). Reines has taught at UC Berkeley, Columbia University, The New School, the European Graduate School, and Tufts. Melissa Gordon (born 1981 Cambridge, MA, USA) lives and works in London. Solo exhibitions include Mimetic Pleasures, Boesky East, New York, USA; Confusion Condition, Cosar HMT, Dusseldorf, DE; Modern Surfaces, Deweer Gallery, BE (with “Boomerang”, Richard Serra); ZOOOOM, Galerie Juliette Jongma Amsterdam, NL (all 2014); and Material Evidence, Spike Island, Bristol, UK (2013). Recent group exhibitions include During the exhibition the studio will be close, curated by Lorenzo Benedetti, Wiels Contemporary Art Centre, Brussels, BE (2014), and upcoming shows will be at The Bluecoat, Liverpool, with the first staging of a play by Mina Loy, and at the Overbeck-Gesellschaft, Luebeck DE. With Marina Vishmidt and Kaisa Lassinaro she has produced the journals PERSONA (2013) and LABOUR (2011). Gordon is a Lecturer of Fine Art at Goldsmiths University, London, and is represented by Marianne Boesky Gallery, New York. Her catalogue Material Evidence is published by Sternberg Press (2014). Melissa Gordon will discuss her research into female artists who have “dropped out” of the art world, framing their actions within the wider context of feminist art’s expansion / rejection of authorship, and attempting to debunk the assumptions of failure surrounding the gesture of being absent. Touching on the fallible notion of ‘the original’ and the problematic gesture of “aggregating” as recently written about by David Joselit, Gordon will consider recent court cases around authorship in order to question where the boundaries of an artist persona / authorship are mapped in the contemporary playing field. She will discuss Cady Noland’s essay “Towards a Metalanguage of Evil”, published in the Documenta IX catalogue in 1992, as a key to understanding the “game” in which presence and absence operate. Meredyth Sparks will address the structural problems that arise in attempting to integrate “recovered” or “overlooked” artists into an art historical canon, as well as the complexities surrounding authorship as it relates to gender. Sparks will focus on two artists, the Baroness Elsa von Freytag-Loringhoven and Eileen Gray, both of whom made significant contributions to modern art, poetry and architecture, respectively, but who have only recently begun to be recognized within primary historical narratives. 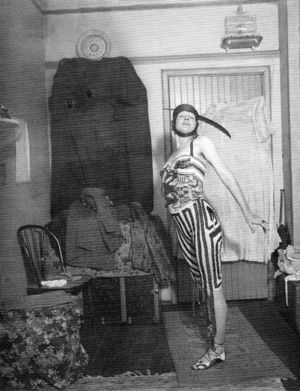 The Baroness Elsa von Freytag-Loringhoven (1874 – 1927) was a German-born poet, sculptor and proto-performance artist whose influence on and shaping of Dada have been, until recently, marginalized and misunderstood. 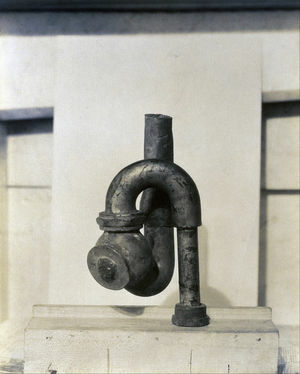 New research by the Baroness’s biographer, Irene Gammel, among others, uncovers evidence to suggest that Marcel Duchamp’s Fountain (1917), arguably the most significant artwork of the 20th century, was perhaps a work by the Baroness. 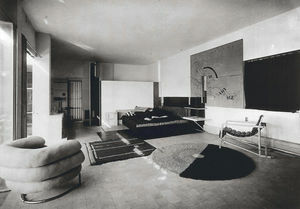 Eileen Gray (1878- 1976) was an Irish-born designer and architect whose house, E. 1027 (1926-29), had for many years been attributed to Le Corbusier. 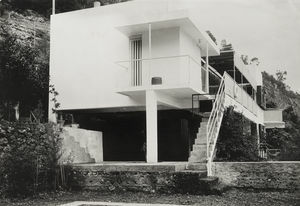 This misattribution stems, in large part, to an (in)famous act of “claiming” on Le Corbusier’s part, a physical and conceptual appropriation that has only recently begun to be reconsidered by historians. With this discussion, Sparks hopes to examine how these artists’ contributions have, in the best case scenario, been misattributed or, in the worse case, intentionally claimed. Re-visiting these placards might open a new art historical or studio-based space for production where, instead of merely correcting or righting a dominant narrative, we might conceive of art and history as an accumulation (rather than a singular realization or articulation) of ideas and methods.